Hello Friends, here i inform you , about website Process . Websites at 5000Rs Only .Including Many features. Customized Webdesign , Logo, Unlimited Domain Mail Id's, Unlimited Pages and More . 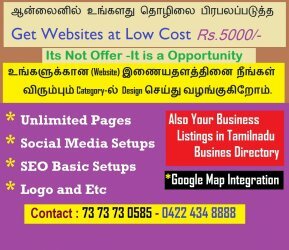 Also we can add your listing details on Tamilnadu Business Diectory -Its Completely free Listing Only. You can use for your promotions and all.